Mad dogs, Englishmen and some very hardy German Twinning Association visitors went out in the midday rain during their biennial trip to Petersfield from Warendorf. Thanks to a wonderful spirit and boundless optimism, no one let the rain spoil the enjoyment of the planned events. The first day's outing was to Portsmouth. It included shopping at Gunwharf Quays, climbing the Spinnaker Tower and a boat tour of the harbour. On Friday we visited Arundel Castle, home of the Howard family, and wandered around the town's attractive streets, full of antique shops. After a pleasant lunch at the riverside pub, the Black Rabbit, where most of the Warendorfers ordered fish and chips, we explored the Wetlands Trust - in sunshine! A trip to the Hogs Back Brewery proved very popular and our German friends learned all about English beer and how it's brewed. Full advantage was taken of the Chinese buffet evening meal. Saturday saw a small group of intrepid Germans and one hardy Brit attempting a Downlands walk. This was one of the worst rainy mornings and the hikers regaled us afterwards with tragi-comic tales of being soaked, losing shoes, being splattered, slipping and sliding. They all thought it was great fun and a genuine 'highlight' of the visit. The sun shone for Sunday's coach trip to the Isle of Wight. We spent several hours at Queen Victoria's favourite royal residence, Osborne House, where we toured the house and grounds. Everyone was fascinated by the memorabilia on display, especially the photographs, paintings and documents relating to Victoria and Albert's nine children and their 'placement' on so many thrones of Europe. The Warendorfers were particularly interested in the direct link between us Brits and Kaiser Wilhelm who was one of Victoria and Albert's grandchildren. We all saw the irony in Victoria and Albert's idealistic vision that marrying off their many offspring to European royals would act as a kind of insurance policy against war. The rest of the sunny day was spent driving around the picturesque island, stopping at Yarmouth for refreshments. Because of all the rain, a road we were to take had subsided so our coach driver had to re-route calling upon all his driving skills to navigate narrow country lanes, with the steering wheel on the 'wrong 'side. This proved to be quite a challenge when we met four-wheel drive vehicles coming in the opposite direction! Monday found many of our German visitors and their British hosts braving the weather yet again to witness the Olympic Torch relay through Petersfield. It certainly did rain on our parade but spirits were not dampened as everyone bonded together to cheer on the Olympic representatives. The traditional farewell dinner for our 41 German twinners and their hosts was held at the Folly Wine Bar. 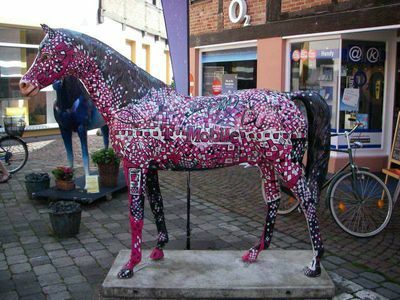 Warendorf is renowned as the 'horse capital of Germany' with its famous State Stud, founded in 1826. And so it was very fitting that Warendorf's Deputy Mayor, Klauss Artmann, presented Petersfield's Deputy Mayor, Peter Marshall, with a commemorative glass engraved with a beautiful figure of a horse. Other gifts came from Warendorf's chairperson, Susan Bock, to Phil Chapman and Gill Clarke, Petersfield's chairman and secretary respectively. They included a photo taken during Warendorf's own celebration of our Queen's Diamond Jubilee as well as a DVD of the event. Lots of hugging and handshaking took place on Tuesday morning as we gathered to see our Twinning friends off for their long coach ride back to Warendorf. Phil Chapman presented each of them with a Jubilee key ring consisting of a crown, union jack and model of the Jubilee's royal coach. We are all looking forward to next summer's visit to our German friends - hopefully, in the sun! There’s a first time for everything and that’s just what this holiday offered me: first time through the Hindhead tunnel, first time through the somewhat larger Chunnel and first time in Warendorf. At last I would get to see why everyone raved about the place. First impressions showed a fairly flat landscape of farmland with large farmhouses, many horses and large acreages of maize blowing in the wind. That there is a certain amount of breeze was evident from the large number of wind turbines. 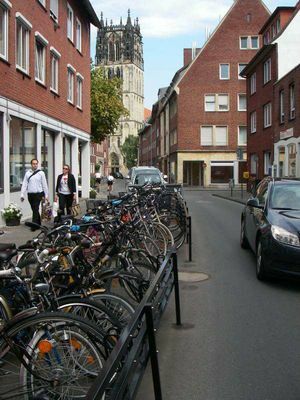 The fact that the environment and being eco-friendly is important (the Greens are part of the coalition governing Westphalia) was also shown by the huge number of roofs covered with solar PV panels and the quantity of cyclists of all ages using the dedicated cycle lanes which are well separated from the traffic and form an extensive network. Because of planned trips to Münster on the first day and Soest and Möhnesee on the second it wasn’t until the weekend that I had a chance to see Warendorf town itself. 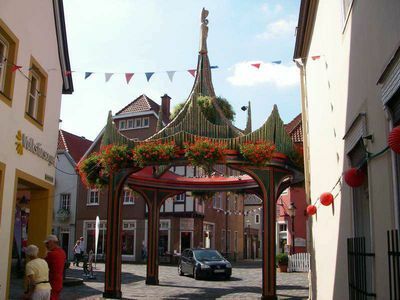 I had already realised that it was quite a bit bigger than Petersfield and now this was confirmed as Susan Bock, Chairman of the Warendorf twinning took us on a guided tour to see the arches which had been especially erected around the town to celebrate the Assumption of the Virgin Mary. (photo:arch)These arches of which there were nine, were situated throughout the medieval town centre and were erected by groups in each neighbourhood following a tradition started in the early 1700s by two journeyman joiners from Warendorf, who had seen triumphal arches erected in Vienna in honour of the Austrian Empress Maria-Theresia. In the evening after nightfall we re-entered the town centre which had been transformed. There were no streetlights and the only illumination came from strings of red bulbs covered in red paper lanterns, lit displays featuring the Virgin Mary in shop and house windows and the arches themselves, mostly lit with bulbs but three lit by open gas flames. It was all rather magical and we were just a few of many people who filed through the streets visiting the arches and listening to groups of musicians at each arch playing hymns and sacred music. Of course this is a festival which will never be seen in Petersfield firstly because it is Catholic and second and most importantly because Health and Safety would definitely not allow it! Many areas were pitch-black and with the very uneven cobbles it seemed to be an accident waiting to happen. One of the arches had open gas flames at below head height and a few singed jackets were the least of the possibilities. Rather refreshing that the Germans haven’t had their hands tied by H&S! The following morning several of our party joined the religious procession and service for which the arches are intended, I however, was taken by my hostess to have an early morning dip in the town’s rather splendid open air pool. 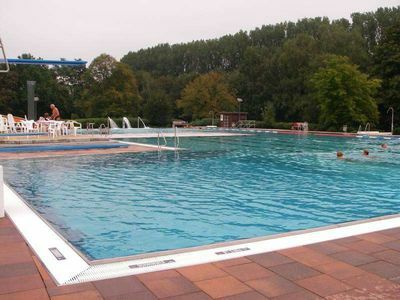 (photo: openair pool) We met Rodney and Rosemary Clark there and being on the committee of Petersfield’s pool, Rodney and I immediately began taking mental notes. Interestingly the lifeguard seemed to take his duties ite casually and we assume this is another example of fairly lax H&S rules. Our second day dawned wet and grey and so it was when we arrived in Soest. This rather beautiful medieval town is famous for its half-timbered houses and buildings made from the local green sandstone and its ducking see-saw and never-frozen pond. (photo:Soest) Excavations show that it has been a place of human habitation for the past 4000 years because of the fertile land but also the saline springs from which salt, a vital commodity for preserving foodstuffs, was produced. Our guide had lived in Soest for over 30 years but said that until someone has eaten a sack of salt they are not regarded as truly native. Soest was a member of the Hanseatic League and amongst other things traded salt, which contributed to the townsfolk becoming ‘stone-rich’ as they say in German. A medieval fair was being set up and every now and then we ran into rather strangely dressed folk, tethered ponies and canvas pavilions with meat roasting on open fires and big cauldrons of stew bubbling away. 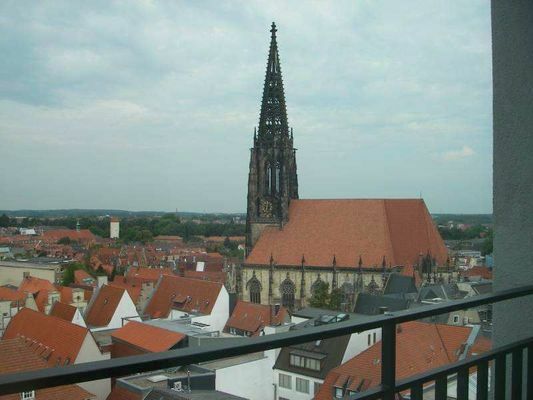 They were celebrating the Feud, which occurred in 1444, when Soest decided to split from the Archbishop of Cologne, overlord of the town, who was demanding ever-punitive taxes. Soest was besieged for 5 years before the Archbishop ran out of money to pay his troops. Some of the costumes were lovely and I felt tempted to join the ‘raggle taggle gypsies’ despite the rain! I cannot finish with Soest without mentioning the fabulous stained glass or the Westphalian Last Supper complete with boar’s head, beer in large tankards, ham and of course, pumpernickel, both to be found in the St Maria zur Weise church. In our jam-packed week the group also visited Burg Hülshof, the moated small castle home of famous poet Annette von Droste-Hülshoff where we had lunch in the sunny courtyard and some of us struggled to translate German proverbs provided by Uli and Susan, found as carvings on the stairpost in the house.